Hi all, I've been working on a 2006 3.0 for a little while now and I'm a little bit stumped at this point. The hatch does not work at all. I've replaced the actuator with a (supposedly working) good condition one from eBay, but to no avail. I made sure the part numbers were correct for the vehicle, and the new part looks identical to the old part. Now when I press the hatch release button in the center console, I occasionally hear a click, but it's pretty intermittent. Nothing happens when I use the button on the hatch itself. 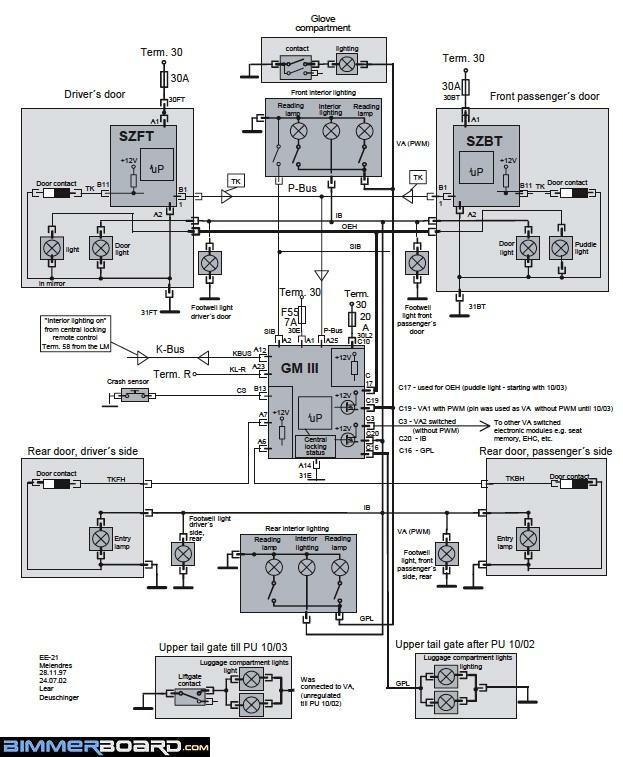 Are there any diagrams of the hatch actuator wiring that I can reference? I'm thinking the next step would be to try and manually activate the hatch actuator with an external power source to see if the actuator is working or not. 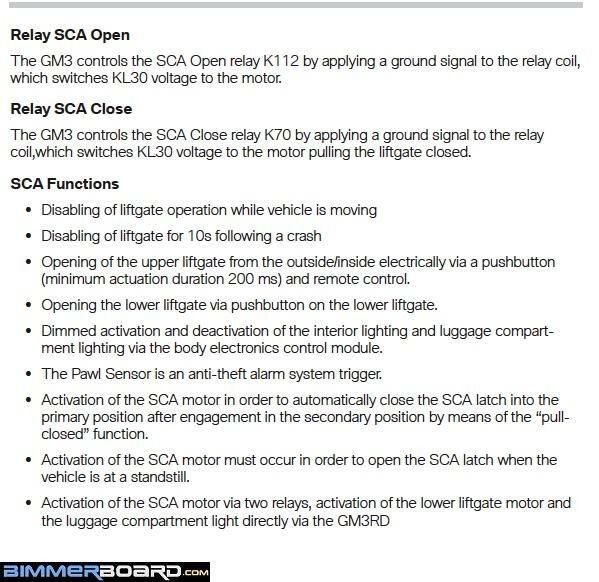 If that's working correctly then it's a wiring issue in the vehicle itself. Something else that's not working that may or may not be related is the remote key. The key is a brand new OEM key, ordered from a dealership. I've attempted to initialize it but that isn't working either. The key still starts the X5 and locks/unlocks the doors. The central locking fuse is fine as well, and I can lock/unlock the X5 from the door handle and from the interior lock/unlock button. When I lock/unlock it with the key, it makes all the normal sounds and beeps. The other issue is that none of the power outlets work aside from the ones in the trunk area... the fuses for that are all fine too, oddly enough. 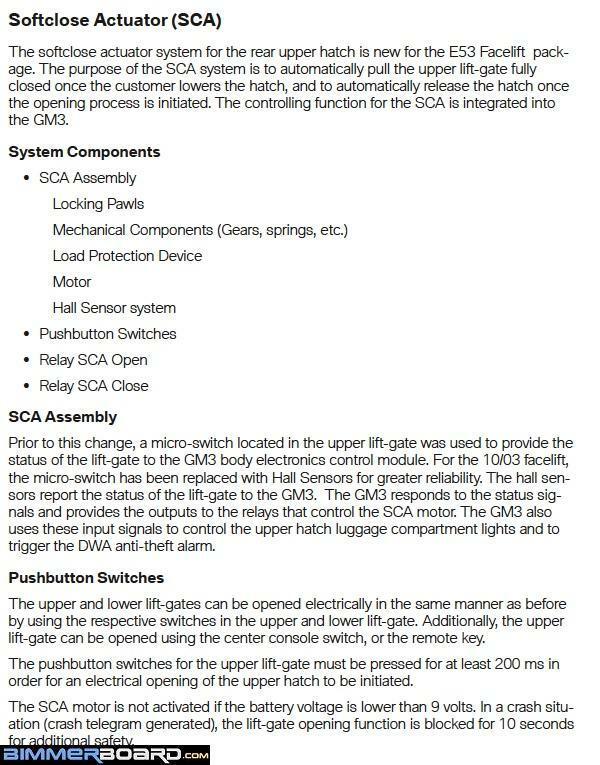 Not sure if the key and outlet issues are related to the hatch issue, but I figured I'd mention them in case they're related to some big underlying cause (like a faulty GM?). Any help/advice would be much appreciated, thanks! Sounds like you have a wire bundle with some damage. The wire bundle going through the right side of the hatch on my car was filled with water and when I emptied it out suddenly my remote worked again for a while. Last edited by Qsilver7; 07-12-2018 at 09:21 AM.